MGB 81 was ordered on the 27th November 1940, laid down on the 16th December 1941 and launched on the 26th June 1942. She commenced trials on the 8th July 1942 on the Hythe Course, Southampton Water and with a displacement of 45.5 tons she attained a maximum speed of 38.63 knots at 2,400rpm and a maximum continuous speed of 34.75 knots at 2,000rpm. Later on BPB trials, following the fitting of underwater exhausts, a maximum speed of 43.43 knots was achieved at 2,400rpm. MGB 81 was commissioned and accepted on the 11th July 1942. The MGB then worked up at HMS Bee, the Coastal Forces base at Weymouth and in August 1942 joined the 8th MGB Flotilla at Dartmouth, where the first five boats were based, following their move from HMS Beehive at Felixstowe in July 1942. MGB 81 was involved in 6 actions before being designated as a MTB in 1943, but no awards were made to her crew. The first action on 13/14 August 1942 off Guernsey was a close range gun attack on two enemy armed trawlers during which one trawler was severely damaged. The 8th MGB Flotilla returned to Felixstowe in September 1942, however the boats were occasionally based at Harwich. The second action was on the 10/11 September 1942 off the Hook of Holland when three minelayers were engaged by the enemy, however the MGBs had no contact with the enemy. A few days later on the 14/15 September, again off the Hook of Holland two small enemy motor vessels were damaged by gunfire and later four armed trawlers were hit, with no damage received to the MGBs. The fourth action was overnight 2/3 October 1942, off Holland, when four enemy armed trawlers were engaged. MGB 78 was lost during this action. During the fifth recorded action on the 27/28 February 1943, once again off the Hook of Holland, the MGBs contacted a German convoy and had a gun action with escorts. MGB 79 was sunk and MGB-81 was hit by a shell in the engine room, putting her twin Oerlikon out of action and received three other hits. In late April 1943, the 8th MGB Flotilla again moved to Dartmouth, where the Coastal Forces base had been renamed HMS Dartmouth II, however MGB 81 was at Brightlingsea in refit from 29th April to 20th May 1943, following which she rejoined the flotilla at Dartmouth. In June 1943 a collision with MGB 115 resulted in underwater damage to MGB 81's stern and consequently the craft was repaired from 14th June to 23rd July 1943 at BPB yard at Poole. In August 1943 the base at Dartmouth was again renamed, becoming HMS Cicala, with the boats of the 8th MGB Flotilla normally lying alongside HMS Aberdonian. Her last recorded action as an MGB was on the 11/12 September 1943 off Cap la Hague when she was fired on by German shore batteries. MGB 81 was hit and suffered shell damage. Hence from 16th September to 1st October 1943, MGB 81 was again at BPB yard at Poole for action damage repairs and the fitting of new type rudders. An official Order dated the 26th August 1943 redesignated MBG 81 to MTB 416. The necessary action was left to the local Command, thus the effective date was around the end of September in the case of the 8th MGB Flotilla. The Flotilla itself was also renumbered the 1st MTB Flotilla, the official Order dated 16th September 1943 and came into force on the 15th October 1943. For a short period in October 1943, the 1st MTB Flotilla transferred to Ramsgate (HMS Fervent) before returning to Dartmouth. MTB 416 was again in refit at BPB, Poole from the 5th January to the 2nd March 1944. Her first recorded action as an MTB was on the 21/22 April 1944 in Lyme Bay, when three groups of E-boats were plotted in the area. The MTBs were vectored on to the five enemy craft and engaged two at close range, and MTB 416 suffered action damage. The MTB was then back to BPB, Poole for further repairs from the 28th April to 27th May 1944. She was back in service for the Normandy landings and was involved from the 6th to the 30th June. A few days after D-Day, the flotilla transferred from Dartmouth to HMS Hornet at Gosport and at the beginning of July 1944 was reallocated to the Eastern Flank. Overnight on the 23/24 June 1944, MTB 416 was involved in an attack on a German convoy leaving Cherbourg. Although MTB 416 was only backing up the operation one of her crew was killed. In the following month on the 18/19 July whilst operating off Cap d'Antifer, MTB 416 was vectored and got hits on R-boats, however her hull was damaged by shell fire and she returned to BPB, Poole for repairs. 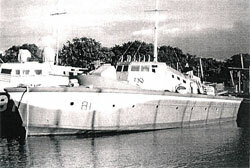 Following the withdrawal eastwards of German land forces, the 1st MTB Flotilla was moved from HMS Hornet to HMS Mantis at Lowestoft in August 1944. Shortly after arriving at Lowestoft, the five surviving boats of the 1st MTB Flotilla were joined by a new 71½ft MarkVI boat. Further new boats arrived in September 1944 bringing the flotilla strength back up to ten boats. During the period 21 October to 29 November 1944, the craft was slipped and repairs were carried out at Brightlingsea. The MTB 416 was back in action on the 14th February 1945 at Ostend, but escaped damage in the fire and explosion. On the 5th March 1945, MTB 416 and two other craft were approved to lay up in Category "C" Reserve at Poole and later that month were paid off at Felixstowe. The final paying off took place at Poole on the 27th April 1945 and she was taken in hand at BPB, Poole for de-equipping on the 10th May 1945. The remainder of the flotilla were paid off in late May 1945. Approval for disposal was granted on the 2nd October 1945 and the former MTB 416 was handed over to the Director of Small Craft Disposals at Poole on the 25th October 1945. She was later sold to a Mr J. Evans. Unfortunately very little is known of her history until 1958, when she was arrested by the HM Customs at Shoreham having been caught during smuggling operations. She was subsequently sold by the Admiralty Marshall to a Gosport scrap dealer, who removed her engines and running gear.